$300 Instant Savings. Expires Jul 11, 2019. * All prices reflect savings. What to Expect This moderately-paced, locally hosted tour requires minimal walking and is suitable for most levels of physical fitness. For those looking for an introductory experience to the colorful culture, incredible sights and unforgettable natural wonders of South America, your search is over! 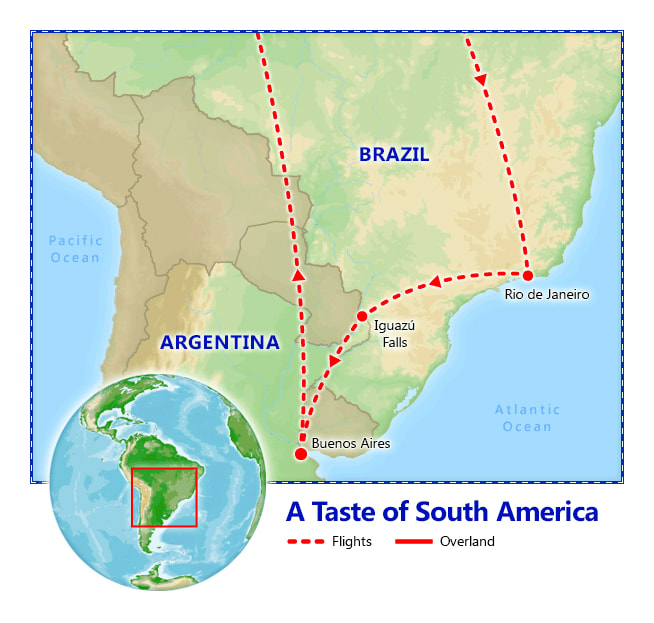 Our new 11-day A Taste of South America small group tour combines the excitement of urban exploration in Rio de Janeiro and Buenos Aires with the breathtaking experience of witnessing Iguazu Falls from both the Argentinean and Brazilian sides. Start your adventure with 3 nights in Rio de Janeiro where you will dine at a typical Brazilian churrascaria, ride the cogwheel train up Corcovado Mountain to the iconic Christ the Redeemer statue, and take a cable car to the peak of Sugar Loaf Mountain. Then spend a few magical days at Iguazu Falls, a UNESCO World Heritage Natural Wonder, and a vivid reminder of the beauty and grandeur that our big, beautiful world has to offer! Explore the falls from both sides, plus the incredible Devil’s Throat, then travel to Argentina’s capital, Buenos Aires, The "Paris of the South." Here your guide will take you through the colorful plazas and lively neighborhoods, including a stop at the famous Recoleta Cemetery where Eva Peron is buried! Don’t miss this very special opportunity to explore the breadth and depth of South America, complete with a fully-guided itinerary, international round-trip flights, transfers, many meals and so much more! Instant Savings: Get $300 off if you book by Jul. 11, 2019! 1. This option requires a minimum of 4 passengers to operate. 1. Early check-in is subject to availability. We confirm your selection usually between 2 to 3 business days of your reservation. 1. Late check-out is subject to availability. We confirm your selection usually between 2 to 3 business days of your reservation. Accommodations: 3 nights Arena Leme, Rio de Janeiro, or similar. For November 19 departure: Windsor Leme. Included meals: Dinner. Full Day Itinerary: This morning, arrive in Rio de Janeiro, the crown jewel of Brazil’s Atlantic shore, designated as World Heritage by UNESCO. Transfer to your hotel located by the beach. Enjoy the rest of the day unwinding at Copacabana Beach or Leme Beach. Later, join your fellow travelers for a welcome dinner at a traditional Brazilian churrascaria. Full Day Itinerary: After breakfast, drive to the Corcovado train station and board the cogwheel train for a 15-minute ride up Corcovado Mountain to the base of the Christ the Redeemer statue. With its outstretched arms visible from everywhere in the city, this 125 ft. art deco statue designed by Polish-French sculptor Paul Landowski is the most recognizable landmark of Rio de Janeiro and is listed among the New 7 Wonders of the World. Marvel at the spectacular 360° panoramic view of Rio de Janeiro! This afternoon, visit the hangar of the Acadêmicos da Grande Rio samba school. Here you will learn about the history of the Samba, and the elaborate preparations of the floats and costumes for Carnival. Enjoy a delicious lemon caipirinha, Brazil's national cocktail, and take advantage of the opportunity to try on some of the costumes and take memorable pictures! Full Day Itinerary: Enjoy the morning at leisure. This afternoon, drive along the beach to Praia Vermelha (Red Beach) in the Urca district. From here, board the cable car that ascends the famous Sugarloaf Mountain in two stages. The first stage brings you to the Urca Mountain station, where you can admire the attractive gardens and lookout points, before boarding the second stage to the peak. From the top of this 1,300 ft. crag, you can see the crescent beaches in full view below. After enjoying this amazing vista, return to Praia Vermelha and continue to downtown, crossing the beautiful Flamengo Park. Visit the New Cathedral, with its modern design based on the architectural style of the Mayan pyramids. Accommodations: 2 nights Mabu Thermas, Foz do Iguaçu, or similar. For January 7 departure: Bourbon Cataratas. Included meals: Breakfast. Full Day Itinerary: Transfer to the airport and board your flight to Foz do Iguaçu, on the Brazilian side of Iguazu Falls. Upon arrival, transfer to your hotel for check-in. In the afternoon, visit the falls. Upon seeing Iguazu, Eleanor Roosevelt exclaimed "Poor Niagara!" You'll soon discover why this UNESCO World Heritage Site is considered one of the greatest natural wonders of the world! Straddling the border of Argentina and Brazil, the Falls consist of 275 inlets and cataracts that cascade down 250 ft. framed by multiple rainbows and mist that rises up to 500 ft. in the air. 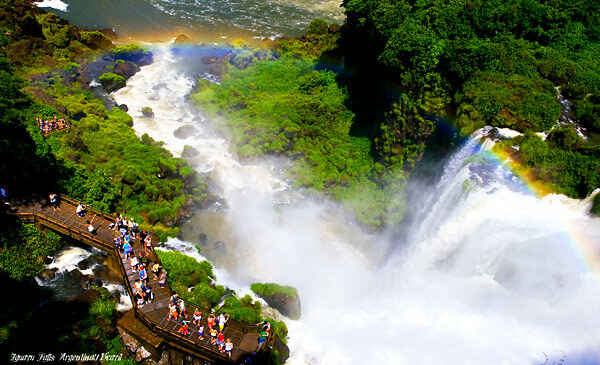 Iguazu is certainly among the most impressive waterfalls in the world, and is counted among the New 7 Wonders of Nature. 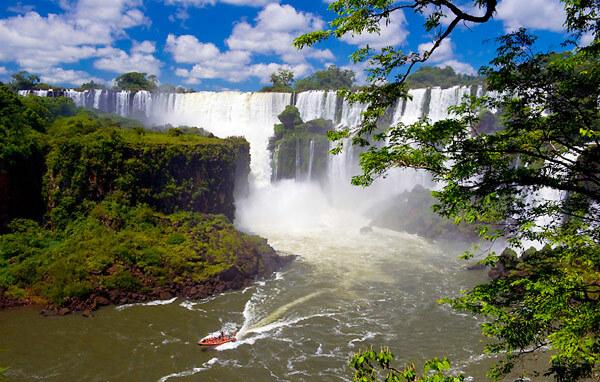 Admire these magnificent falls from the Brazilian side, strolling down the platforms that bring you up close. Come prepared to get sprayed! Optional Excursion: Dinner & Folklore show at Rafain Cataratas, $70 per person In the evening, enjoy a performance of traditional dances of different countries and regions of South America, along with a delicious dinner of local and regional specialties. 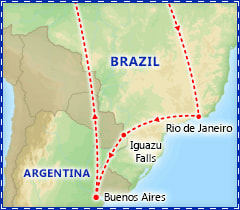 Full Day Itinerary: This morning, after going though international customs control, cross the Tancredo Neves Bridge between Brazil and Argentina. Once in Argentina, travel through the rain forest to the most spectacular sight at Iguazu: Devil's Throat, a massive U-shaped cataract that measures 270 ft. high, 490 ft. wide and 2300 ft. long. Continue to the upper Argentinean falls, including the San Martin Falls. Return to your hotel in Brazil for an evening at leisure. Accommodations: 3 nights Palo Santo Hotel, or similar. For November 19 departure: Vitrum Hotel. Included meals: Breakfast. Full Day Itinerary: After a relaxing morning, once again cross over the Iguazu River and continue to Puerto Iguazu Airport to board your flight to Buenos Aires, the bustling capital of Argentina. Upon arrival, enjoy the ride along the Rio de la Plata waterfront and across multiple parks en route to your hotel located in the trendy Palermo neighborhood. Enjoy the rest of the evening at leisure. Full Day Itinerary: Discover why Buenos Aires is so often referred to as “the Paris of the South.” Each neighborhood has its own distinctive flavor, but everywhere you go, the people are warm, welcoming and happy to see visitors. Your exploration begins at the Plaza del Mayo, the historic and political center of the city. You'll see the Casa Rosada, the presidential palace from which Juan and Eva Perón spoke to throngs of adoring Argentinians. Continue to the Obelisk landmark on the Avenue 9 de Julio, the widest avenue in the world. Then, stop at the crowded Florida Street, a true shopper's paradise. Pass through the colorful neighborhood of La Boca with its famous colorful painted houses and street tango performers. Admire the French architecture in the exquisite Recoleta neighborhood, including the beautiful Cemetery of La Recoleta, where Eva Perón, affectionately known as Evita, is buried. It is one of many ironies of this complex city that Evita, heroine of the poor, is buried in the most elegant (and expensive) section. Learn more about the musical traditions of Argentina at a private performance featuring singers and musicians who will take you on a journey through the landscapes of Argentina reflected in the traditional rhythms and songs unique to each region of the country. Optional Excursion: Dinner & tango show, $115 per person This evening, enjoy dinner and an exciting performance of the tango, Argentina's passionate national dance. The performance will take you along on a journey through the development and evolution of the tango from its inception in the 19th-century suburbs of Buenos Aires through its golden age in the 1930s and 40s and its newer developments in the 1970s and 80s. Enjoy the day on your own. Or, choose an optional excursion to learn about the life of the gauchos on the Pampas! Full Day Itinerary: Enjoy the day at leisure to explore Buenos Aires independently. 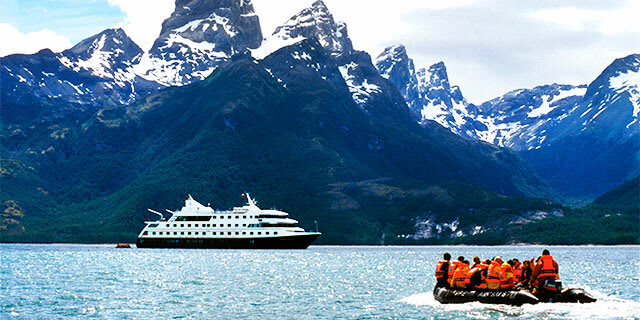 Alternatively, join an optional excursions to the Argentine Pampas! Afterward, join your fellow travelers for a farewell dinner. Optional Excursion: Argentine cattle ranch with barbecue lunch, $210 per person Travel outside the city for a full day excursion to the Argentine Pampas. Visit a traditional estancia (ranch), where you'll discover the life of the Argentine cowboys known as gauchos. You'll be met with welcoming wine and empanadas. After a sumptuous asado barbecue lunch, you will enjoy a colorful folklore show of traditional Argentine dance and song, all in traditional dress, as well as an exciting demonstration of gaucho horsemanship. (Private transportation will be provided to/from the estancia, accompanied by an English-speaking guide. The activities at the ranch are shared). Note: This optional excursion must be pre-purchased and requires a minimum of 4 passengers to operate. Optional Excursion: Tigre & Parana Delta, $95 per person (purchased locally only) This morning, head to the northern part of Buenos Aires. On the way, pass through beautiful gardens and enjoy a panoramic view of the Rio de la Plata. Catch a glimpse of the River Plate Stadium and Buenos Aires University. The first stop will be at San Isidro, where some of Argentina’s wealthiest families reside. Visit the elegant and well-preserved historic quarters, including the neo-Gothic San Isidro Labrador Cathedral, built between 1895 and 1898. Continue to the town of Tigre, on the Parana Delta, the rowing capital of Argentina. After free time for lunch, enjoy a catamaran ride on the Parana Delta, navigating through a maze of rivers and islands, before returning to Buenos Aires. HEALTH REQUIREMENTS/PRECAUTIONS: A Yellow-fever certificate of vaccination is not required for entry into Brazil, however due to the presence of yellow fever throughout much of Brazil it is highly recommended to obtain a yellow fever vaccine at least 10 days prior to travel. Remember to bring mosquito repellent and lots of sunscreen. Facing the beach in one of Rio’s most relaxing neighborhoods, the Arena Leme Hotel is a great place to unwind, and to enjoy the trendy Leme waterfront. 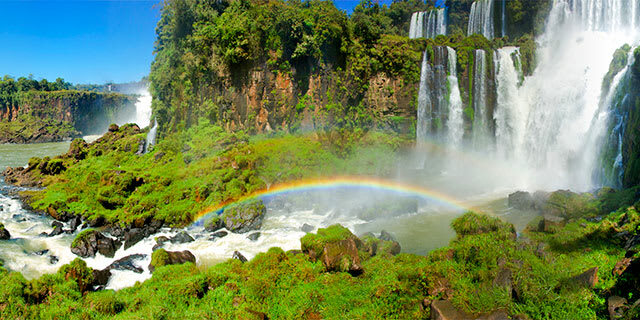 Conveniently located 13 miles from Iguazu Falls, 6 miles from Foz do Iguaçu Airport, and just 4 miles from the tri-border marker with Argentina and Paraguay, the Bourbon Cataratas offers a great base to explore the UNESCO World Heritage site that is Iguazu Falls and relax on a 605-acre property surrounded by lush tropical gardens. With over 800 plants covering the walls and balconies, and a 60-ft fountain flowing from the top floor to the lobby, the Palo Santo Hotel is the first urban green hotel in Latin America. Located in the trendy and fashionable Palermo Hollywood neighborhood of Buenos Aires, where many young emerging chefs have set up their signature restaurants, Palo Santo’s location is perfect access to a variety of cuisine at the many modern trendy bars and restaurants that surround it. The Palermo Hollywood neighborhood is also home to several art galleries showcasing works from contemporary Argentinean painters. Located in the trendy neighborhood of Palermo Hollywood, the Vitrum Hotel offers an ideal location to enjoy this culturally rich section of Buenos Aires. The area around the hotel is teeming with bars and restaurants, bookstores and art galleries, theaters and dance studios. Facing the beach near the north end of world-famous Copacabana, the Windsor Leme Hotel is in a wonderful location to enjoy a relaxing stay in Rio de Janeiro.